Built-in lease payment calculation support, including a leasing integration with GreatAmerica Financial Services and Ingram Micro Lease-IT!. 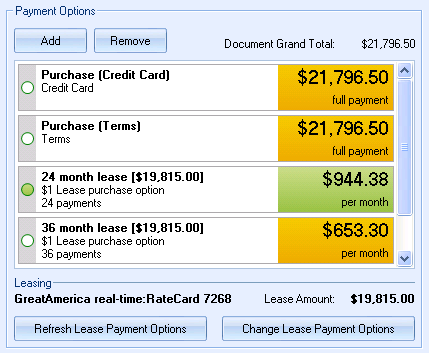 QuoteWerks has built-in lease payment calculation support. You can very easily offer your customer the option to purchase or lease the quote. QuoteWerks makes it effortless to give the customer multiple lease choices such as 12 months, 36 months, FMV purchase, $1 buyout, 0/1 upfront payment, etc. 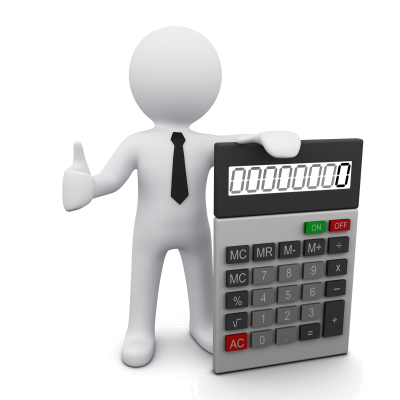 As the quote total changes, the lease payments automatically re-calculate! All leasing companies are supported, simply enter your leasing companies lease rate factor data into QuoteWerks. When the quote or proposal is delivered using QuoteValet, as the customer changes options, the lease payments are automatically re-calculated to reflect the new quote total. The customer can choose to purchase the quote outright or can choose a leasing option. QuoteWerks supports a real-time leasing integration with GreatAmerica Financial Services. Offer leasing options to your customers via GreatAmerica without leaving QuoteWerks! When you select your GreatAmerica lease card, the real-time query to GreatAmerica will enable you to see all the lease options available from GreatAmerica such as terms, advance payments, points, and purchase options. Just select the combinations of options you would like to see and GreatAmerica provides all the iterations of those combinations. Once you've had a chance to see them, you can choose which ones you would like to offer to your customer. QuoteWerks automates the process of submitting the credit application to GreatAmerica. This can be initiated before or after quoting leasing as an option to your customer. You can submit a new credit application to GreatAmerica and check on the status of the application from within QuoteWerks. When you check on the status of the application, if the quote amount has increased above the last requested credit application amount, you will be prompted to resubmit and update the credit application. The QuoteWerks Real-time Module is required for the GreatAmerica integration. Real-time with Ingram Micro Lease-IT! QuoteWerks has partnered with Ingram Micro Financial Solutions and supports real-time leasing integration with Ingram Micro Lease-IT!. When you select your Ingram Micro Lease-IT! lease card, the real-time query to Ingram Micro Lease-IT! will enable you to see all the lease options available from Ingram Micro Lease-IT! such as terms, advance payments, points, and purchase options. Just select the combinations of options you would like to see and Ingram Micro Lease-IT! provides all the iterations of those combinations. Once you've had a chance to see them, you can choose which ones you would like to offer to your customer. The QuoteWerks integration also has the ability to submit a credit application. The QuoteWerks Real-time Module is required for the Ingram Micro Lease-IT! integration. 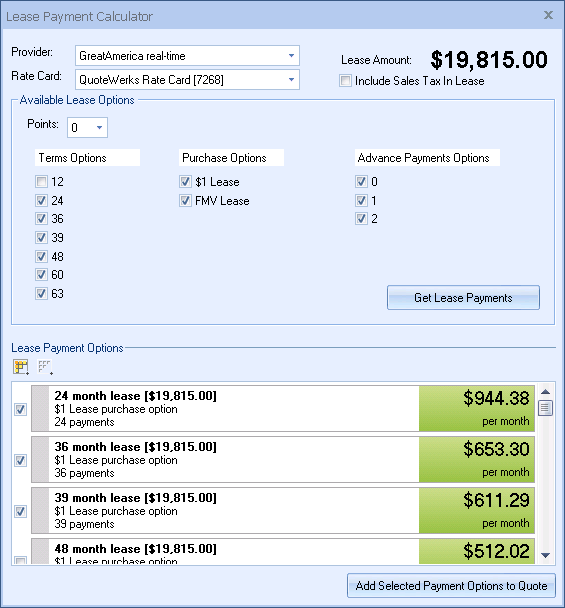 QuoteWerks enables you to create, edit, and maintain your own Lease Rate Cards. If you do not have a Lease Rate Card in your ..\QuoteWerks\LeaseRateCards folder, you can save this file (SampleLeaseRateCards.xml) to that folder location. The QuoteWerks Online Help Documentation has additional information about using, adding and editing Lease Rate Cards. If you are upgrading QuoteWerks from a version earlier than Version 5.0, you will need to download these templates which have the changes in them to display the leasing and payment options. You can then apply your changes to these layouts or you can see what changes are in these layouts and copy those changes to your existing layouts. These layouts are the default layouts that are installed with a fresh installation of QuoteWerks version 5.0.